If you like platform games, they don’t come much bigger and brighter than Zool 2. Iain Laskey looks at the Jaguar version of this award winning game. Zool 2 has been released on just about every machine around and has now arrived on the Atari Jaguar. This version has been enhanced and claims to be the fastest, most colourful version of all. Body: When the game first starts there is a nice ray-traced intro sequence of Zool before the main screen appears. You can play as either Zool or his female sidekick Zooz. The options screen lets you choose the difficulty level, whether inertia is active and the number of players. When in two player mode, you can use one or two controllers. The gameplay is certainly fast. Unfortunately it’s also very repetitive. Each of the seven levels involves avoiding or shooting the enemies and collecting the various items that are liberally littered around the game. There are the obligatory power-ups to be collected including bombs, a second ninja and shields. If you can collect 3 Zoon tokens, you get to play a special bonus level. Each level has its own flavour with different sprites and backgrounds although the basic game is identical in each case. The first level is fairly straightforward and the graphics, especially the backgrounds are rather lacklustre. The later levels are generally nicer looking though and provide more of a challange. It’s not always obvious how to go about completing them and often some split second timing is required to navigate your ninja around. The Bulberry Hill level has tubes that accelerate your ninja upwards with a wild spinning rather reminicscent of Sonic games. There are also fried eggs and trampolines to jump on to get the height needed to reach some parts of each level. Graphically Zool is easily as good as any 16bit console but not much better. There is no slowdown even when the action gets furious and the parallax scrolling works well enough. There is the odd pleasing detail such as the eyes on the huge Egyptian death masks following you around. The colours are bright and breezy but overall, the game looks like it’s aimed at the younger audience rather than the more discerning gamer. The sound is certainly never far from your thoughts when you play. The tunes are worryingly catchy and all kinds of weird and wonderful sounds play as your ninja dashes about shooting and collecting. It sounds like the sort of game Jeff Minter would have written. A real let down is that you cannot save your current position. High scores are saved along with SFX and music levels though. At best Zool 2 is competent. It’s well programmed but the game itself is unexceptional. The Jaguar sorely needs a killer platform game to rival the Sonics and Marios of the world. Unfortunately, this isn’t it. Hopefully, Ubisoft’s new game, Rayman will be the Jaguar platformer that others will be looking up to. If you have a burning need for a platform game, then Zool 2 is worth a look but play it first before you buy. Pros: Fast and frantic action. Big bright levels. Cheaper than most. Cons: Can get repetitious. No game save. Roll up sports fans and prepare for some serious basketball. There’s no doubting that sports games sell by the bucket these days. The Jag has always been a bit of a poor relation in this respect though. Hopefully NBA Jam will change all this. NBA Jam allows you to play against the Atari Jaguar or your friends. Whilst the Jaguar plays a mean game, it’s when you’re up against real people that games like this start to shine. With the ability to use both the Pro Controller and the Team Tap add-on, NBA is designed with just this in mind. NBA Jam allows up to four players to compete together. Each game consists of four quarters. At the start of the first quarter, you choose your two players. You should aim for a mix of strong shooting along with good passing and blocking. If your combination of players doesn’t work out, you can always substitute either or both at the end of each quarter. Badly injured players can also be swapped out this way. Assuming you win, you then get to play against another team. As the matches progress, you slowly work your way up the league. The computer players start out very easy to beat but soon toughen up as you start to improve your play. Don’t expect to finish this cart in a hurry. With over 120 different NBA stars available for you to compete with (and against) you’ll be well occupied for some time. During play, the A, B and C buttons act as shoot/block, pass/steal and turbo. These are used in various combinations to play the ball in a variety of ways. Exactly which manoeuvres can be performed is also controlled by the players individual abilities. You get different points depending on the distance you managed to make a successful shot from. In some game modes, powerup icons appear on the court to add extra abilities and increase skills. The graphics are generally pretty good, especially for a cartridge. Each of the players have been individually digitised with representations both at selection time and during play. Unfortunately, the heads on the players are oversized to an alarming degree making them look deformed. The animation is adequate although a little more effort on the backgrounds would have improved things a lot. It is also quite hard to follow which player you are controlling during fast play. Lots of static screens add to a generally polished overall appearance. The soundtrack pounds along with suitably frantic tunes and all sorts of audio effects add to the atmosphere. The sound is a cut above the average for a Jaguar game with individual calls for the various players. The Options screen has plenty of adjustments to gameplay including tag mode, computer assistance and various timer parameters. Overall, NBA Jam TE is a difficult game to quantify. In multiplayer mode it really comes into its own but for solo players the charm may wear off all too quickly. Some people really rate this game highly though. This is probably a game you should try to have a go of in the shop before splashing out your sixty quid ; after all, this is in the upper tier of Jaguar prices. Back in the day I used to review Atari Jaguar games. In this instance I was also a beta tester. The Jaguar version of this one was really good, the PC version, not so much. As one of the better Jaguar titles, it’s nice to note this one was produced by Atari UK. At the time I used to work quite closely with Darryl Still and Alistair Bodin, two excellent chaps at Atari. Penguins was one of the games they were responsible for bringing to the Jag. From the land of Monty Python and The Hitch-Hiker’s Guide to the Galaxy comes the latest example of zany British Humour. Iain Laskey comes face to face with the Mutant Penguins. Every now and then a game comes along that can’t really be described in anyway that does it justice. Attack of the Mutant Penguins, or AMP, is one such game. Aliens have decided to invade the Earth and prior to arrival they’ve tuned into our TV broadcasts to see what we look like. Unfortunately for them they picked a nature program and mutated into the first thing they saw – penguins. At the last minute they realised their error and tried to make the best of it by dressing up as different types of humans, hoping they’d be able to blend in. The only thing that stands in their way is Earth’s last hope, Rodney and Bernard. Each level has a theme such as cowboys and indians, clerics or Elvis. The object is to stop the Mutant Penguins from reaching the Doom Scales. You can play as either Rodney or Bernard. Each has a different set of weapons. To help you in your quest you have various machines and tricks you can use. In addition, the real penguins who are upset at the bad press these upstart mutants are giving them, have decided to help you beat the aliens. If more mutant penguins get to the scales than good penguins then the Doomsday Weapon is triggered and life as we know it comes to an end. Like the classic game, Lemmings, each level of AMP requires you to work out the correct combination of actions that will allow the good penguins to get to the scales whilst stopping the mutants. Various chests are placed around each level. These can contain parts of extra weapons, good penguins and other bonus items. To open them you need to collect the blue gremlins and drop them on the chests. The more gremlins, the quicker the chests open. The machines are delightful devices. Some have rotating knives which slice up the mutants as they try to walk past. Others grab the bad guys and skewer them on big metal spikes resulting in a flurry of feathers and bits of gory body debris as the victim explodes. Wonderful! The different themes are also important. On the Elvis level there are jukeboxes. If you can find a coin and deposit it in the jukebox , music starts to play and any Elvis penguins that pass by just have to stop for a boogie, buying you valuable time. The cowboy levels have campfires and if you manage to light them, the cowboys all sit by the fire, start eating beans and, well, have you ever seen the film Blazing Saddles? At the end of each level you get one of 3 random mini-games to help you vent those anti-alien feelings some more. The game can be a little confusing to start with and helpfully Atari have put in an automatic tutorial that explains what everything does the first time you use it. After that, gameplay continues uninterrupted. The graphics are very amusing with brilliant sprites, all well animated. Some elements are so good it’s often tempting to do things just because the results are funny, not because they actually help you complete the game. The noises are generally good although the intro music sample is terrible. Very rough sounding. AMP requires a bit of effort to work out what to do. It’s well worth persevering though. The only real problem is that there are only 60 levels which isn’t really enough compared to other games of this genre. Maybe an opportunity here for AMP 2? AMP is the first of a series of games that have been produced by Atari’s European Development Centre and as a benchmark of quality sets a fine standard. Pros: Amusing graphics, good puzzles. For as long as I can remember, I have been fascinated by technology. At school I was the first to get a programmable calculator in the form of a Texas TI with a whopping 50 odd steps. This was quickly followed one that had a clock and alarm built in. Amazing stuff. But then it happened. Wandering home from school one day, I glanced in the window of a shop that sold office supplies. There, in the window, sat the future. An 8K PET. The next day I told my friend and in our lunch hour we ran down to the shop and gawped at it. My friend then pulled out a battered looking ETI magazine and announced that 8K meant it could store 8 thousand characters of information. Eight thousand! This was to me a staggering amount of information. Alas, it cost about £600 and I earned £1 a week pocket money so the future for me wasn’t quite there yet. Fast forward a few years, I had left school, started working for a bank and begun earning big money. Well, sort of, compared to pocket money. It also provided me with the chance to get a cheap bank loan. The next few weeks consisted of trip after trip to WH Smith, scanning the few computer magazines that existed until I had narrowed down the choice. The Sinclair ZX80 was just being replaced by the ZX81 but whilst cheap, it wasn’t good enough for me as I had already been spoiled. In the previous few months, I had been hanging out at a CB club and made friends with one Apple Pie (don’t you just love those CB handles?). Apple Pie, naturally, had an Apple II (and, surprisingly, a girlfriend). The Apple II became my specification benchmark. Whatever I bought had to have colour and sound. Thus, the shortlist shrank down to an Apple II, a DAI (an oddball Belgian micro as I remember) and an Atari 400 (the 800 was right out the question, price wise). The decision was helped by the local proximity of Maplin Electronics. I arrived and was met by a number of Atari 400 and 800 machines, 810 disk drives, cassette decks, piles of software and one Atari obsessed young Saturday boy. He showed me a few games that after being raised on the Atari VCS and its somewhat limited graphics, totally blew me away. A great many Atari computers at that time were sold on the back of the game Star Raiders much as BBCs would be sold as a way to play Elite some years later. For me though, the moment of truth was Jawbreaker. This classy Pacman clone had transparent ghosts. Graphics didn’t get any better than that. Decision made. Bank loan arranged, purchase completed. It’s difficult to appreciate in hindsight just how expensive computers were back then compared to an average wage. I bought an upgraded 32K Atari 400, a 410 cassette deck, one game (Voodoo Castle, a Scott Adams text adventure) and thus spent almost 4 months wages in one exhilarating hit. Back home, the Atari was reverentially plugged in, powered up and gawped up as a white text on blue screen came up with the word ‘READY’. And I was, ready for the future. This was a computer. It could do anything. I started to load the game. After almost 20 minutes of burbling and screeching, the message ‘BOOT ERROR’ appeared. A second go worked though and I was launched in to gaming heaven. Not only was I immersed in my first text adventure, it even had a modified character set to look like ye olde writing. As the game unfolded I found my self starting to get nervous after typing each command in fear of something horrible happening. Such was the power of the text adventure and a fired up teenagers mind. The next day I decided to see if I could write my own games so I booted to Basic and started tapping away. An hour or so later I had come to the conclusion one needed to know a bit about computers as everything I typed just got echoed back to me preceded by the friendly message ‘ERROR’. One quick phone call and my ETI magazine owning friend turned up. He now had experience of computers from collage. With an almost Roger Moore like knowing expression he cryptically advised ‘you program them using peek and poke’. He then started to type in various poke commands. Most did nothing although a couple crashed the Atari. The fact that they even crashed it struck me as ultimate wisdom. This man was a God. I had to learn the things he knew. The following week I picked up the very first issue of Computer and Video Games magazine and a book on Atari Basic. Over the next few weeks I read the book and typed in the Atari game called Trench from C&VG. Needless to say, my typing was less than perfect and it took several days before I could get the game working but it had taught me a lot. Every time I ran it and something went wrong, I scoured the printout in the magazine to see where my typing differed. When a new typo was found, I realised that line of code must be related to what was happening on screen. The fact that I was even able to make a game appear on the screen by typing in commands myself and then have colours, sounds and a game was an awesome thing to behold. As each new issue of C&VG came out, another listing was duly typed in, debugged and as a result, my skills improved. In the meanwhile, I had been making regular trips to Maplins. The Saturday boy was still there along with an increasingly tempting array of goodies. The boy himself was usually engrossed in writing his own software using the Macro Assembler. To see a mortal produce colours and movement on the screen using such low level and arcane methods whetted my appetite. It was one thing for the gurus at Atari to write games this way but for a kid in a shop in Essex? I bought the Assembler/Editor cartridge and a 6502 programming book and rushed home. I always had a soft spot for the Assembler/Editor manual. On page one it proudly proclaimed that it had been extensively proof read and that if any example programs didn’t work, it was the reader’s fault, not Atari’s. The fact that two listings actually had the word ‘ERROR’ on some lines, indicating a syntax error was to me quite amusing. After a few false starts I was soon using a mixture of Basic and assembler to put together games and utilities. I also started picking up the American magazines Analog and Antic which specialised in Atari computers. Apart from the copious and useful listings, they had reviews of stuff not yet available in the UK. Speech synthesizers, databases, digitising tablets, new programming languages and more left me envious as did the prices Stateside. It was around this time I joined the big boys and bought a floppy disk drive. 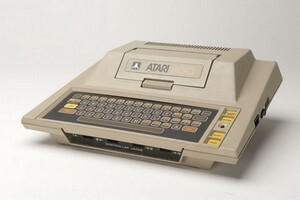 The Atari 810 held a massive 88k and cost a mere £350. Just two months salary by then. It revolutionised things. Suddenly games loaded in fifteen seconds, not twenty minutes. My programs could save data to random access files. I could also start to buy the more sophisticated software that only came on floppy disk. As most of these needed 48K, I had the Atari 400 upgraded. For ‘just’ £100, Maplins took the old 32K card and replaced it with a 48K one. Now I could play the state of the art games such as Choplifter. By then, the first stage of my computing life was starting to come to a close. Within the year my Atari 400 was replaced first by an Atari 800 from well known dodgy local emporium Scientific & Technical as they were being phased out and could be picked up cheaply, and then shortly after by an Atari 130XE (128k of RAM) and a 1050 disk drive. The 1050 was quickly enhanced by an internal board that sped up disk reading and writing, increased capacity and copied protected games. Since then I have owned an Atari 520STM (The Traveller program got ported to STOS), an Atari Ste (4 megabytes! ), a Mega Ste (a hard drive!) and finally an Atari Falcon before succumbing to the PC and the world of Windows. My first PC was a 486SX multimedia unit with 4 megabytes of RAM, a 120Mb hard drive and all the trimmings. The Traveller program got ported to Visual Basic 4. I’m currently typing this on something somewhat quicker with enough peripherals hanging off it to do pretty much anything. The Traveller program is midway through being ported to C#. I still miss my 32K Atari 400 and that READY prompt though.